From Right: The Director General, Nigerian Maritime Administration and safety Agency (NIMASA) Dr. Dakuku Peterside, Secretary General International Maritime Organisation (IMO) , Kitack Lim and the Secretary General International Seabed Authority Michael W. Lodge at the first global conference on sustainable blue economy currently going on in Nairobi, Kenya. The Director General of the Nigerian Maritime Administration and Safety Agency (NIMASA), Dr. Dakuku Peterside, has said that development of the blue economy is a veritable strategy for advancing African economies and lifting the people out of poverty. Dakuku stated this on Monday in Nairobi, where he led a high-powered Nigerian delegation to the opening of the first global conference on sustainable blue economy. Dakuku stated that it was high time Africans took advantage of the continent’s enormous maritime potential to develop their countries, explaining that climes without as much opportunities are making worthy use of the ocean economy and increasing the prosperity of their people. 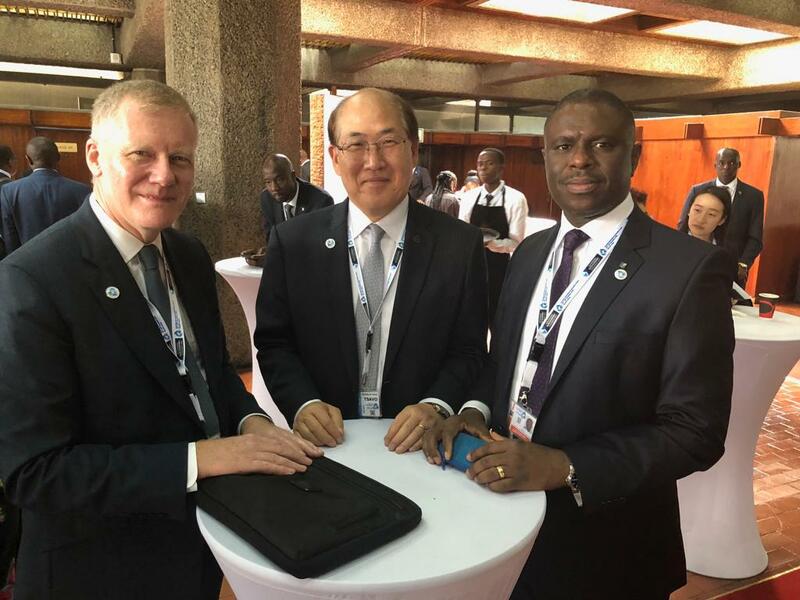 The NIMASA DG, who is also Chairman of the Association of African Maritime Administrations (AAMA), delivered a statement of commitment on behalf of the association during the three-day conference, which is co-sponsored by Nigeria. In it, he detailed the objectives of AAMA, the coordinating body for 38 African Maritime Administrations, to include improvement of the capacities of African maritime administrations, enhancement of member-states’ compliance with international maritime treaties, and coordination of programmes aimed at synchronising the ocean economy with other economic sectors. Dakuku stated, “All these objectives assigned to us by AFrica Maritime Transport Charter put AAMA in a unique position to fully mobilise players in the maritime domain for optimisation of the potentials of Africa’s Blue Economy. “We have already taken a number of steps to realize these goals as set out in our various works and activities. In our past four conferences, we focused on the preservation and protection of the Marine Environment, and are committed to driving these beyond the Sustainable Blue Economy conference, for the simple reason that there cannot be actual sustainability irrespective of the economic benefits without consideration for the health of the Seas and Oceans. Speaking also at the conference, Chairman of the African Union (AU), President Paul Kigame of Rwanda, said the union was committed to the growth of the blue economy in the continent. Kigame said member-states had shown commitment towards sustainable use of the ocean and AU would continue to formulate policies that would engender the development of Africa’s ocean economy. The Prime Minister of Namibia, Saara Kuugongelwa, spoke in a similar vein, saying the Namibian government is committed to developing an integrated blue economy policy geared towards protecting the marine environment of the Southern African country. Kuugongelwa said Namibia had a special fisheries observers’ institution, which puts the country among the leaders in sustainable fisheries management. In his remarks, President of Seychelles Danny Faure, who was appointed to serve as the AU Champion of Blue Economy, said in his own capacity he will get more women to serve on the blue economy regime. This, he said, would ensure that the campaign for the blue economy remained all-inclusive. He also said his country would work on establishing a pan African shipping line. Other African leaders in attendance included the President of Kenya, Uhuru Kenyatta who is the Chief Host of the conference ; President of Somalia, Mohamed Abdullahi Mohammed; President of Tanzania, John Magufuli; President of Zanzibar, Ali Mohamed Shein; President of Uganda, Yoweri Museveni; and President of Mozambique, Filipe Nyusi. The Governments of Canada and Japan who are cohosting the conference were represented by their top cabinet ministers. The inaugural Sustainable Blue Economy Conference, which ends on Wednesday in the Kenyan capital, has over 15,000 participants from around the world. They are gathered to discuss how to build a blue economy that harnesses the potentials of oceans, seas, lakes and rivers to improve the lives of people, particularly those in developing countries.